Have you ever found yourself at the right place at the wrong time, only to find out it was perfect timing after all? Why is it that slapping the forbidden label on something makes it infinitely more enticing? 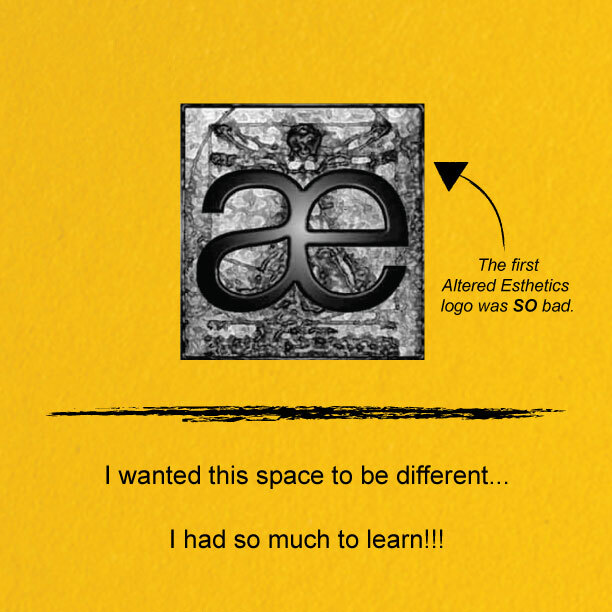 Altered Esthetics was a DIY space in a era of increasing accessibility in the arts, and it was great to be part of a growing movement within the creative community. When you’re thinking about something new - a new project, a new idea - what encourages or discourages you? What motivates you to move forward? 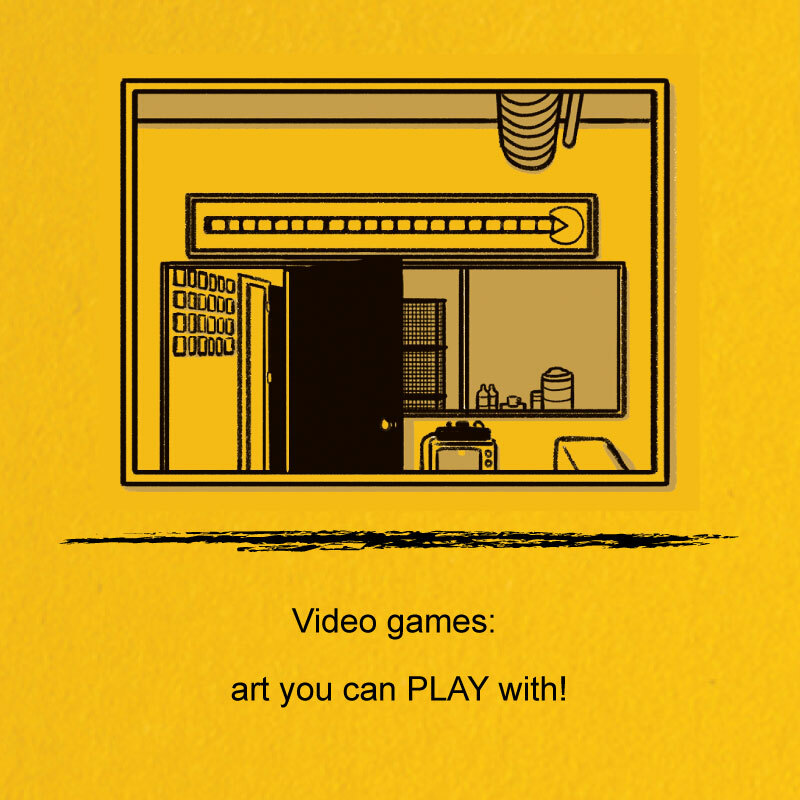 Video games: art you can play with! 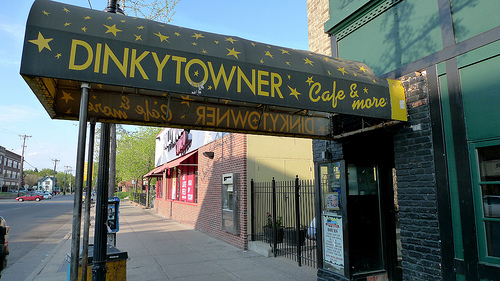 On finding the first home for Altered Esthetics in the Northeast Minneapolis Arts District. I had so much to learn!!! I remember rolling into Minneapolis in September, a few weeks later than expected thanks to some car trouble in Colorado. The reds and golds and browns of autumn leaves were still crisping along the sidewalk. Everything was beautiful, and fall in Minneapolis remains my favorite season. Brian and I arranged with a friend to sublet her place, the upstairs floor of a split-level single-family home. It would be a few days before it was ready, so we spent the first weekend in Minneapolis on the welcoming and ready futon in our friend’s basement. The apartment, once cleared out, was a great first place to stay. Our upstairs abode was in the house next door to our friends and walking distance to little coffee shops and restaurants in Stadium Village and Dinkytown. Both districts were at that point still populated with small and local shops, and we were a quick hop to Espresso Royale or the (old) Purple Onion. My transition from the concrete jungle of Los Angeles probably made me seem pretty touristy to my friends. Squirrels were a novel excitement, and an endless canopy of trees and the picturesque fall foliage served as beautiful frames to every street picture. With a small bit of savings, I had strategically placed myself in a great location for a new adventure, and there were nothing but blank pages on which to write the next chapter. 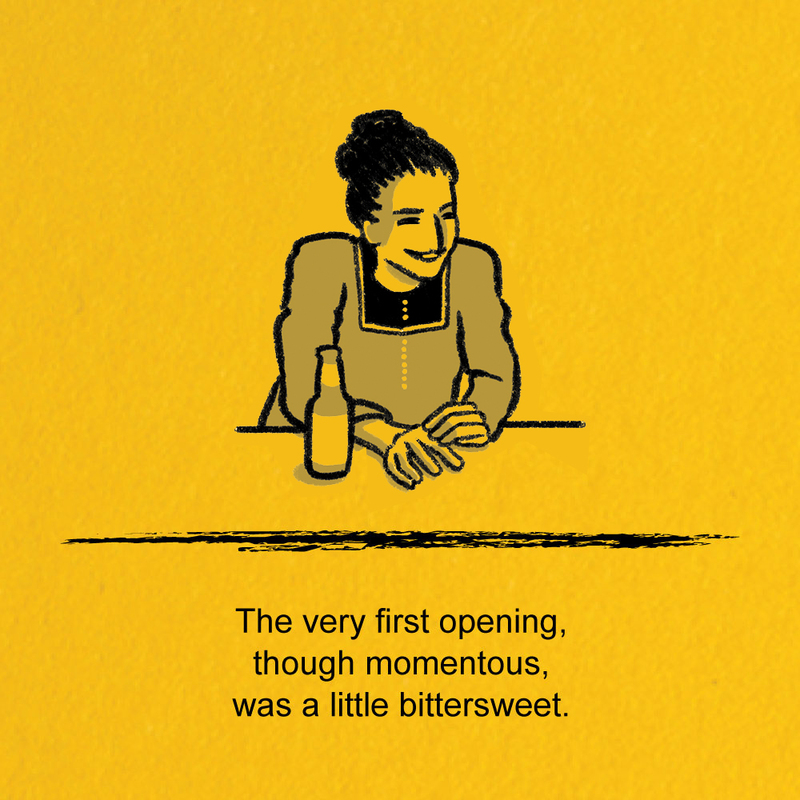 At the time the world seemed open in an exciting but overwhelming way. I wondered: What’s harder? Knowing what you want to do and struggling to get there or not knowing yet what you want and having to learn on the go? I was about to find out. The first page of an empty journal is always the scariest one to write on. In a past and more evocative life, I was a monster. And then, I was a make-up artist. Sometimes, I still get to pretend. I’m curious what venues and spaces helped inspire and welcome my friends and colleagues? What spaces formatively influenced who you are today? Over the next year, I’ll be sharing more from It’s Never Going To Work - and more in general, including a few new articles I’ve been working on. In honor of the new year and many new adventures beginning, here is the opening chapter from my book. Brian and I woke up at the crack of dawn. We loaded up the car with our meager belongings, then circled my parents’ house one last time for anything forgotten. My mom packed us two little coolers with snacks and treats, because she’s amazing like that. She stood at the edge of the curvy walkway that leads up to my parents’ house, arms crossed and trying to smile, my dad beside her. And there they remained as we backed out of the driveway, turned down the street, and gradually drove out of view. As we wound round the mountain roads on our way out of the L.A. basin the sun began to rise, beautiful bright reds and oranges that almost made it hard to see the winding roads ahead. I knew my Social Security number by heart (thanks, college! ), but I was twenty-three and still had no idea who I was. I wasn’t sure what I was going to do with my life, exactly. But I knew I wanted to try life someplace new. 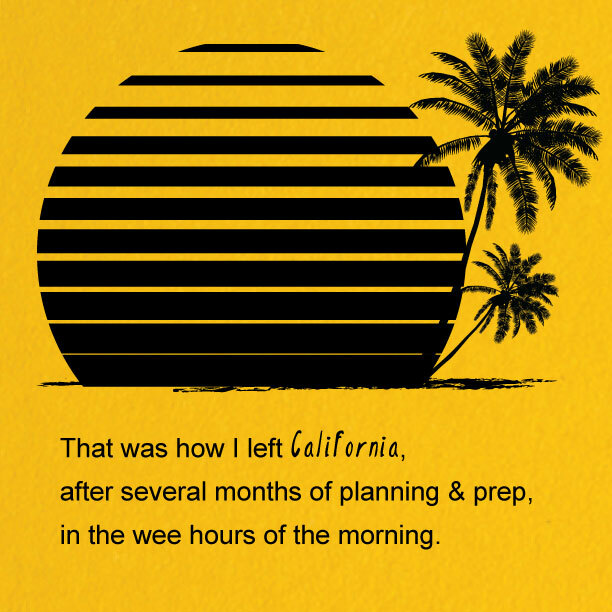 That was how I left California, after several months of planning and prep, in the wee hours of the morning. My boyfriend and I spent our last few weeks in my old room at my parents’ house, having escaped none too soon from a spider-infested apartment. And rather than it being stressful to live with my parents again, it was good to spend a few weeks of concentrated family time before leaving. A mom now myself, I can only fathom how hard that must have been for my own mother. Even writing this makes me choke up a little and want to go wake up my finally sleeping toddler to give her a little squeeze. Adventures like these are a little ways off for her, but I know they’ll be here before I know it. When they come I hope I’m half as gracious, brave, and encouraging as my mother was—my whole family, for that matter. And as my travels would tell: attempting to live in a new place is one of the best ways to bust out of one’s comfort zone. This post is adapted from It’s Never Going To Work: A Tale of Art and Nonprofits in the Minneapolis Community illustrations by Athena Currier. ©2018 Jamie Schumacher. Chapter Title - Mike Doughty. Appropriating the Holidays Part III: Happy Holidays and putting the Christ back in... Saturnalia? The third piece in an ongoing series I’ve been writing about holiday histories. Since it’s the most wonderful time of the year, let’s talk about Christmas! Press and updates on It’s Never Going To Work - plus a special offer for the holidays! 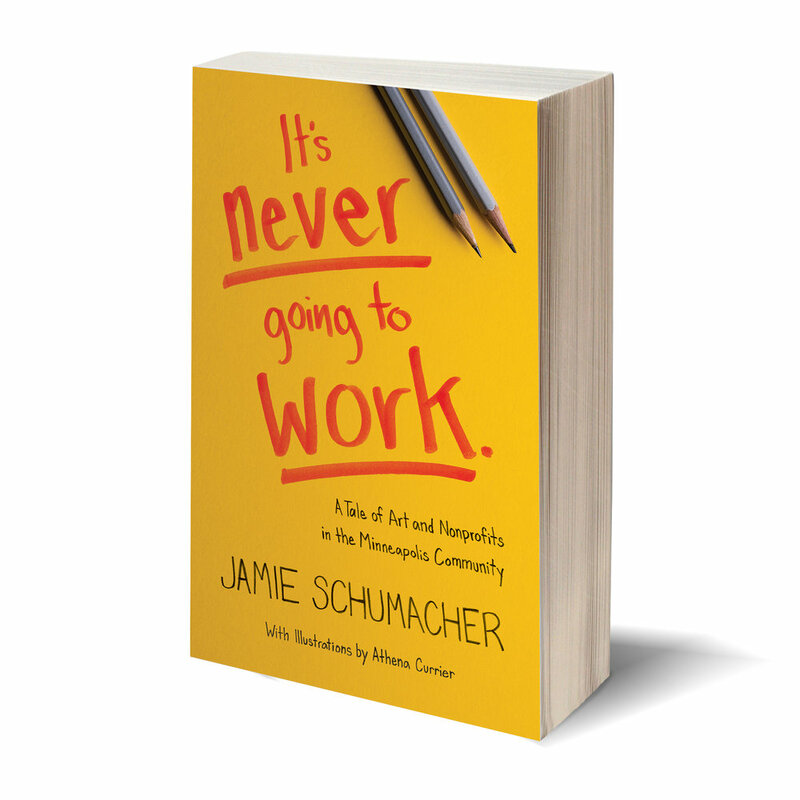 It's Never Going To Work launches THIS WEEK! 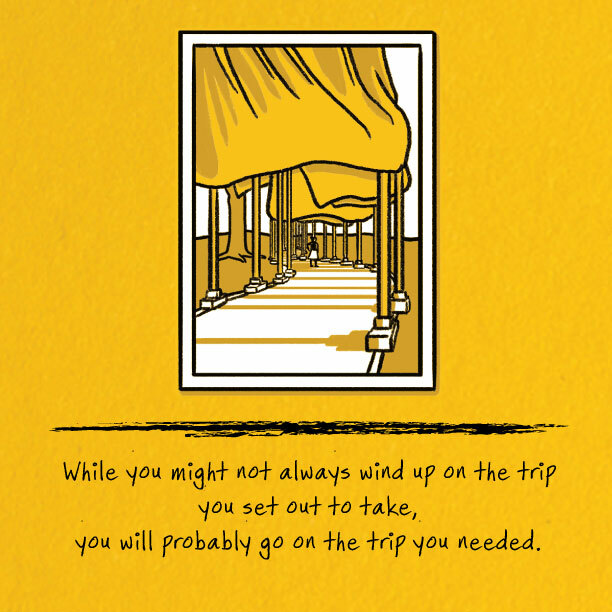 Sometimes the idea of something seems so big, the odds of it happening don’t look promising.